Excel's LEFT function works almost exactly the same as RIGHT. This handy formula allows you to pull a specified number of characters from a string, starting with the leftmost characters and working right. Use it to extract data that lies on the left-hand side of a string, like a City in a City, State combination. Let's take a look at how this function works. This tutorial will be easier to understand if you take a look at our RIGHT function tutorial first. It uses many of the same concepts! In the above formula, we can't use a static num_characters, because the number of characters in each city name is variable. "Boston", for example, is a different length than "San Francisco". What's happening here? 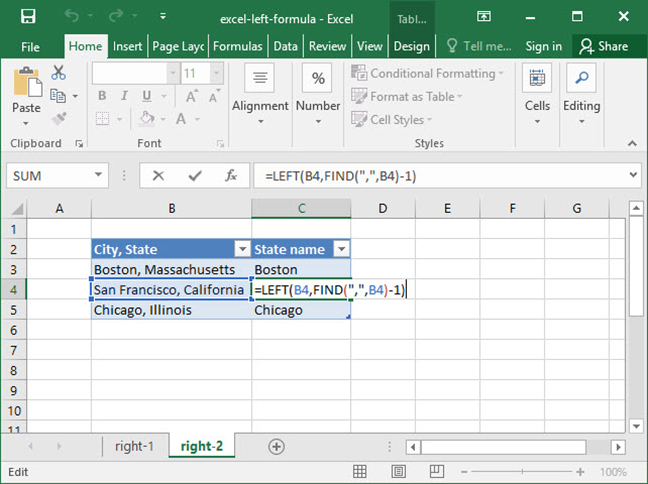 First, Excel performs a FIND for the "," character, finding it at position 7 in the given string. We don't want to pull the 7 leftmost characters in the string "Boston, Massachusetts", because that would result in the string, "Boston," — with a comma at the end. So, we subtract 1 from the value given by our FIND function to get the number 6. We then use LEFT to take the leftmost 6 characters in the phrase, "Boston, Massachusetts", resulting in the string, "Boston". 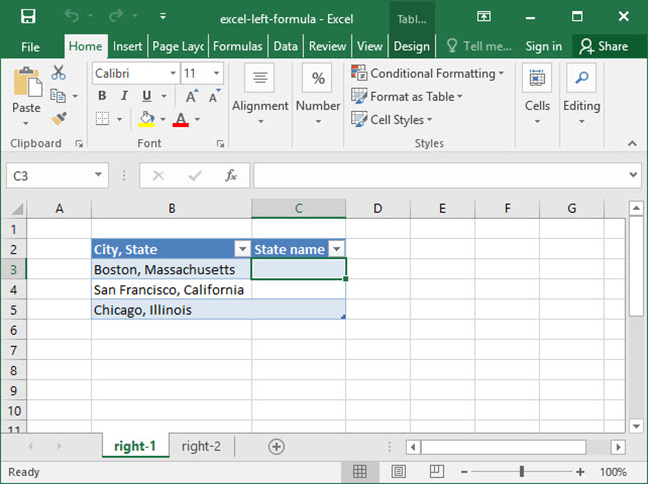 Now that you have a good handle on Excel's LEFT formula, you can use it to extract data from strings that would otherwise be very difficult to handle. Enjoy!